Politics and ethics – they are supposed to go hand in hand. Yet, while they may easily do so in theory, they often do not in practice. Unfortunately, politics in Nagaland appears to be a mixture of three “M’s”- Ministerial power, muscle power and money power. The words of Lord Acton rings strongly in our ears, “Power corrupts and absolute powers corrupt absolutely”. As doubt, frustration and concern plague our minds, we are left with many questions about the future of our State. 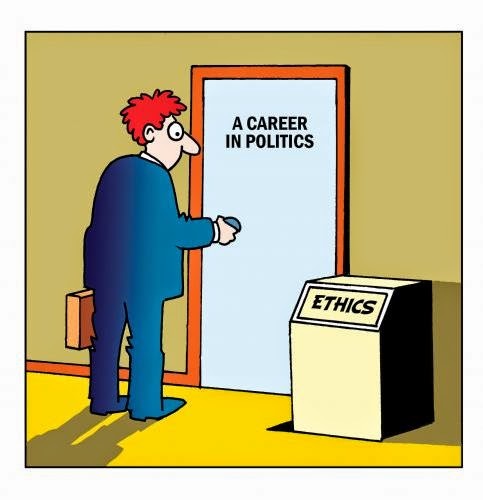 Politics With or Without Ethics? Ethics does not mean what the government prescribes, but what ought to be prescribed. In our practical, day-to-day life, it means a moral justification for every political action. Ethical politics, therefore, means a political system based on some morality. A state will end in disaster if the political activity is shorn of its avowed moral base-both for the ruler and ruled. Every political decision must be ethical in order to prevail. No state will get moral support from the people if its political decisions are based on selfish motives or consideration and not on ethical and moral values. The purpose and objective of state are guided by moral values. What is morally wrong, cannot be politically right because a good state ought to be based on sound moral principles. In India, this moral and ethical base for political activity can be traced in the preamble to the constitution of India. As long as Indian state honors the moral precepts enshrined in the preamble, it is said to be practicing ethical politics, but if it begins to deviate from these moral precepts and deny its people Justice- social, economic and political or liberty of thought, expression, belief, faith and worship or denies them equality of status and opportunity etc., prompted by political motives, its action becomes unethical. Practically it clearly provides that state action should be legally and morally based on sound precepts. In other words, constitutional provision should be honored in both letter and spirit. After more than half-a-century of statehood, most of the Naga citizens are wondering what good governance is or what are the key aspects or why is it important for economic and social development? What lessons have been learned from the past? Where will the state stand ten years from now? To our utter surprise the answer to the questions is void! The government can speak but no actions or measures to implement. The problem of unemployment, socio-economic disparities, regional prejudices, concentration of wealth in few hands, low standard of living, lack of industrial and economic growth, proper health care system, road connectivity, lack of technical and vocational institution, law and order issues, corruption and political intrigues have assumed unmanageable proportions. Unfortunately politics in Nagaland has been a mixture of three ‘Ms’- Ministerial power, muscle power and money power. In the words of Lord Acton “Power corrupts and absolute powers corrupt absolutely”. Whenever a VIP or VVIP has to travel on any stretch of road, martial law like conditions are created treating all ordinary travelers, office goers and people running errands as suspects and criminals. Sometimes perfect gentlemen “Mr. XYZ” get a good beating or scolding at the hands of the protection forces simply because he happened to be travelling on the same stretch of road at that particular time. A pseudo democracy has been imposed, not to speak of liberty, equality and fraternity for the common man, even his fundamental rights are more in breach than in observance. Value based politics has become a rare commodity. There is always contradiction between what the politicians preach and practice. The followers and admirers of the hero try to prove themselves to be more loyal than the king himself. In handling the mass media, they use technique to create, foster and spread myths which have no substance because they are mere phantoms. The struggle for power survival and opportunistic politics degenerate the socio-political scenario. Down the years, we find that greater the mediocrity of the ruler, greater the number of intellectual pygmies hovering around the ‘Actor’. We feel badly let down, rather cheated because countless rulers have betrayed the trust of the people. Writing about the shorn of ethics, which pervaded the Mughal courts after the death of Aurangzeb, historians have recorded that too much of wealth, luxury and leisure had softened the character and degenerated the Mughal nobility. No Mughal family retained its place for more than one or two generations. If the achievements of noble man were mentioned in three pages, the achievements of his son occupied nearly a page and the grandson was dismissed in a few lines such as “He did nothing worthy of being recorded”. Now when we look at the past and read stories of deeds and misdeeds of the politicians and bureaucrats of our present age, we cannot fail to notice the close similarity of unethical politics of the past Mughals. People’s hearts are filled with deep concern, anxiety and anguish. The truth of the matter is that the political condition or art of affairs is creating a very unhealthy impact on the psyche of the people, which stands deeply wounded and bleeding. Glimpsing over the past we have to clip down the ugly feathers of unethical politics for progress and prosperity. The foremost need of the hour is good governance, leadership, technical and managerial competence, organisational capacity, reliability, predictability, accountability, transparency, participation and decision making across a spectrum of social, economic and other areas. The bricks of politics cemented by ethics can lay the strong foundation on which a peaceful and prosperous Nagaland can be built. Today we are faced with stark alternatives of ethics in politics or twilight disaster of the Naga society.